I was just making my weekend list a couple of days ago, and I can't believe that the weekend's almost over. I was able to accomplish a couple of things on my list, so I feel good. Unfortunately, my appointment to visit the prospect apartment didn't push through as they didn't call to confirm my appointment in time. They said they will call me to set up another date. I guess this is one hint of how management is like in that apartment complex. This is my small dining room. There were newspapers scattered all over the floor, so I finally bundled them for recycling. I like to keep my dining table simple and clean, and I just love how I can look out through the glass walls while having breakfast or lunch. It's the perfect place to drink tea especially when it is snowing or pouring rain outside. Here's the busiest nook in my place, the entertainment/living room. I've just built that small bookcase, and it makes the corner a lot "homier." I like to keep my life simple, and I prefer less furniture. If you live in an apartment, it's easier to move with less baggage. Spaces and being able to breathe is most important for me. 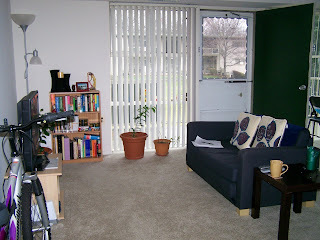 Do you believe that a person's home is a reflection of his/her personality. What do you see? Thanks for sharing these pix. 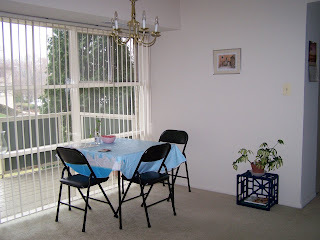 I love, love your dining area. Nakakarelax. Since the entertainment area is the busiest, I assume you're also fond of watching DVDs/TV like me, loves to flip a book while munching on some yummies, etc. Hey, that's a very cute, simple yet cozy home! I like having a balcony most..but as of now, I myself do not have a balcony, lucky you! Hi Kayni! So neat your place. We got the same Ikea sofa hehe. Take care. Hugs! Wits, I never go that nook without yummies. I usually just slide my sofa and start playing with the Wii. Angeli, Thank you. Although the flickering shadows might give me a fright at night. I scare easily...lol. Artemis, Yes, I love having a balcony, and I really think that simplicity makes my place homey. Kero, I love, love Ikea. That sofa's probably the most used chair in the apartment. Even before reading this, I felt the same way too by just looking at the picture! wow, your place looks really neat kayni ;-) i wish mine were too. hehehehe. Anna, I do sometimes give in and just not care about the neatness sometimes. cpsanti, Thank you for visiting =). Nice to see your lil nook and cranny, Kayni. I love the minimalist approach. Very homey, less clutter and a lot of space to move around. And yes I believe that a person's abode reflects her personality. After all it is the only place where you can simply be yourself. Daphne, Thank you. Friends urge me to put more stuff, but simplicity appeals to me much better.